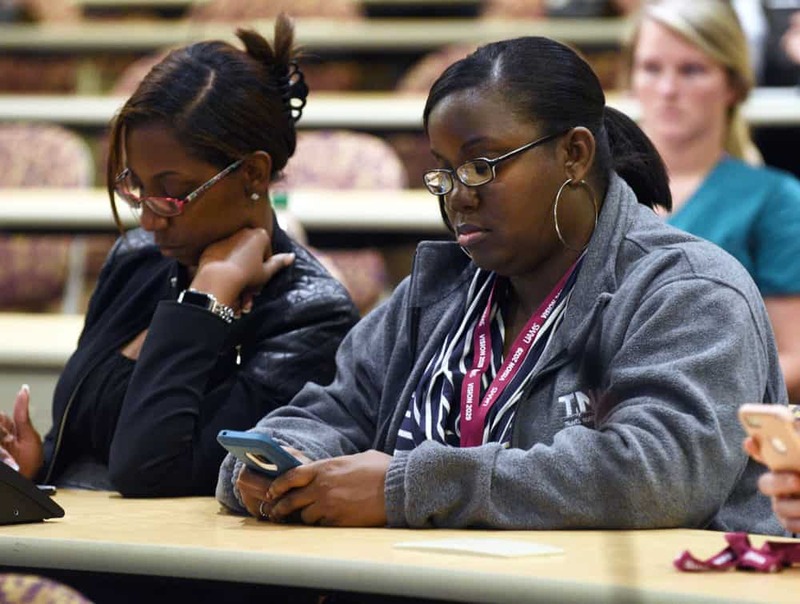 Employees used their cellphones to answer survey questions during the Vision 2029 Town Hall. Oct. 26, 2018 | UAMS held the first of five Vision 2029 Town Halls on Oct. 25 in the Wilson Education Building as employee input was sought for the institution’s next long-range strategic plan. Nearly 100 employees answered questions about UAMS’ strengths, weaknesses and major opportunities for growth in the next 10 years. Stephanie Gardner, Pharm.D., Ed.D., senior vice chancellor of academic affairs and provost, explains the Vision 2029 process during a town hall. Led by Stephanie Gardner, Pharm.D., Ed.D., senior vice chancellor of academic affairs and provost, a Vision 2029 steering committee and the Office of Human Resources’ Organizational Development team are guiding the process toward a plan that will follow the Vision 2020 initiative. The strategic plan will encompass 2019-2029, concluding on the 150th anniversary of UAMS. 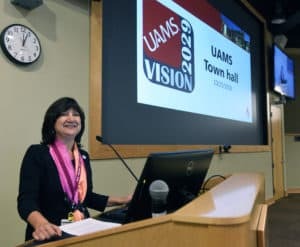 “It is only fitting that this plan will end in 2029 — a year in which UAMS will celebrate our history and look toward our future,” said Gardner. So far, more than 60 interviews and 20-plus focus groups have been conducted with employees, students, leaders in clinical, education and research programs, along with public stakeholders to gather data, which will then be analyzed and used to create the plan. A two-day retreat of 50 leaders is scheduled in December to review the data and develop an outline for the new plan. The goal is to unveil the plan next summer. Mario Wallace of Organizational Development looks as employees’ answers to questions are shown on the screen during the town hall meeting. 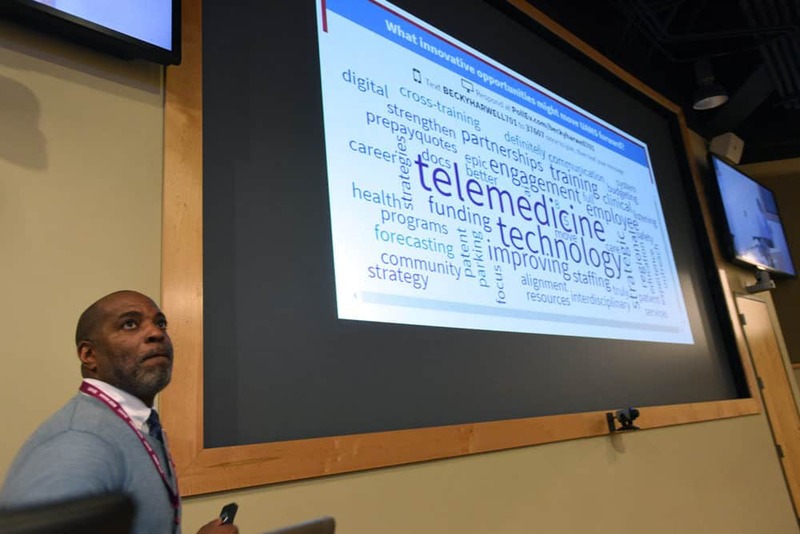 Mario Wallace, a HR senior consultant in Organizational Development, led the audience through a short survey in which employees used their cellphones to text their responses. Thanks to the Poll Everywhere program, real-time data showed on a screen in the room, allowing attendees to see what their colleagues thought. If you are unable to attend the town halls and want to provide your input you can access a short survey via the link below. In addition, if you want to leave feedback not covered in the survey, please send an e-mail to Vision2029@uams.edu.